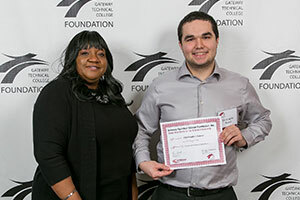 Gateway Technical College Foundation, at its annual award ceremony Feb. 2, awarded 256 scholarships totaling nearly $164,000 and benefiting 208 students by helping them fulfill their career and educational goals. “We are grateful for the commitment of our donors to Gateway students and the community,” said Foundation Executive Director Jennifer Charpentier. One of the new scholarships awarded this year is the MAFSI-WI (Manufacturers’ Agents Association for the Foodservice Industry Wisconsin) for Culinary Arts students. It is for students in either the technical diploma or associate degree programs. For more information on the Foundation – including ways to contribute – please contact Charpentier at (262) 564-2866. Or, go to www.gtc.edu/foundation. Photos of the event can be viewed here: https://flic.kr/s/aHsmxYdHN2.